this weekend, well, mostly it was uneventful. a touch of snow and weather that was just cold enough to keep us inside. which wasn't bad, in fact it was filled with hours in bed watching homeland, SOOOO GOOD. but then an errand needed to be run, far away from the comfort of our covers and computer. so we trekked out to the suburbs, and you know what is in the suburbs? besides our errand, good vietnamese food, that's what. 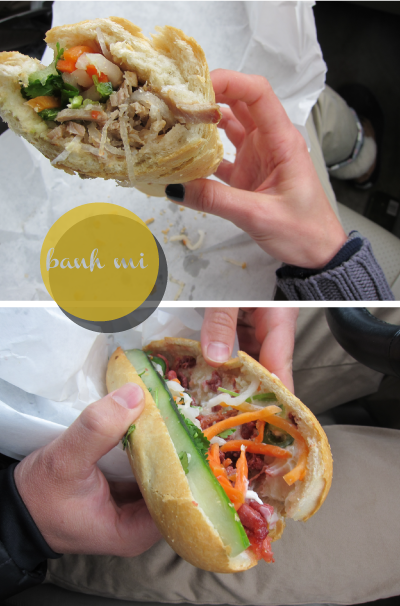 we stopped by banh mi dc and had ourselves the most delicious $9.00 lunch around. we snagged a #2 and #8 and a custard steamed bun. the custard was a bit too heavy and the bun, not as light as i like, but the #2 WAS TO DIE FOR. the #8 wasn't too bad either, but damn, the former has me wanting to go back, like now. the perfectly spicy pork, lotsa mayo and quite a delish showing in the bread department. the mass amounts of cilantro and veggies didn't hurt either. We watched the entire season of Homeland right after Christmas, I think in only two or three massive sessions. Sooooo good. the bread is SO important. now i will have to search yelp for banh mi in oakland. it's shameful that i haven't, as of yet. you *must* try song que in eden center [back corner]. #8 + #10 at $3.75 a pop. and the bread is amazing too—crispy, yet soft. mmm.